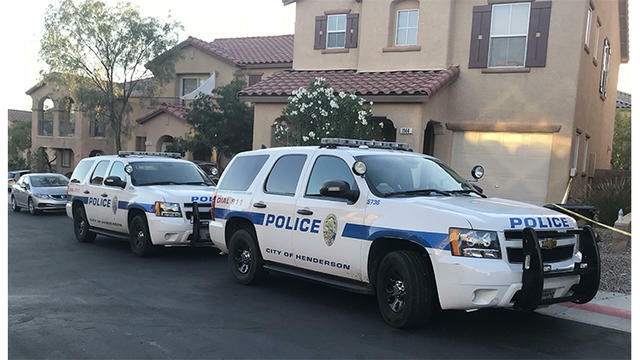 HENDERSON, Nev. -- Police say a 27-year-old man, a 35-year-old woman and two boys, ages 15 and 5, are dead in an apparent shooting murder-suicide at a home found burning in the Las Vegas-area city of Henderson. Police said it appeared the man killed the woman and the children before turning the gun on himself, CBS Las Vegas affiliate KLAS-TV reports. The Clark County coroner didn't immediately release the names of the people who police Lt. Kirk Moore said were found Thursday evening after officers arriving to neighbors' reports of gunshots found the house on fire. "There wasn't any yelling but gunshots, there were like 10 of them," a neighbor, Valerie Galarza, told KLAS-TV. Moore said it did not appear that fire caused the deaths. He did not disclose the relationship between the four. The modest two-story home is in a residential tract in Henderson, a suburban city of about 300,000 people some 15 miles southeast of downtown Las Vegas.